Why is it that we tend to have better moods, increased alertness, or fewer occurrences of illness around places where water crashes such as waterfalls, beaches, or even our bathroom shower? Besides the euphoria of simply being around these features, the answer could very well be microscopic charged particles known as negative ions. While the sound of the words negative ions evokes thoughts of mad scientists or esoteric particle physics, it seems that negative ions tend to have positive effects on us. The benefits of negative ions on the human body can include an increase in the rate at which serotonin (a hormone linked with mood) is oxidized in the bloodstream as well as the interception of microbes and germs in the air. The effects of negative ions have been known since 1789 when a European monk noticed and wondered how medical patients responded to changes in the electrical state of the air they were breathing. However, it wasn’t until after the 1930s that researchers began running experiments and medical studies to provide some scientific basis for how negative ions affect the human body. 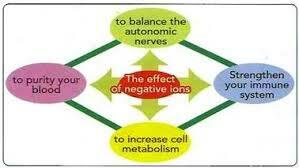 So what produces negatively charged ions? The idea is that falling water splits normally neutral particles in the air and frees up negative ions. The negative ions in turn bond with neighboring smaller air particles, which gives the new compound an overall negative charge. The newly formed negatively-charged air molecules tend to occur near waterfalls or breaking ocean surf. Even flowing water from showers can result in negative ions. Is it any wonder why we feel refreshed and healthier around waterfalls or at the beach? Or, why taking a shower tends to have a therapeutic effect on us?